Every gal needs a ‘go to’ staple dress in her closet. One that at a moments notice she can throw on and feel like a million bucks! This dress does that for me. It has such a fun feel to it. I’ve worn it several times- and always have a really great night! Do you have a cocktail dress in your closet that you LOVE? Send me a picture!! And, no, I am not actually wearing this today. I’m playing tennis all day, and didn’t think you’d want to see me in my tennis gear! Happy Monday, linking up to Monday Mingle. If it’s chilly, throw on a blazer! These probably aren’t the cutest shoes- but I wanted to by comfy! 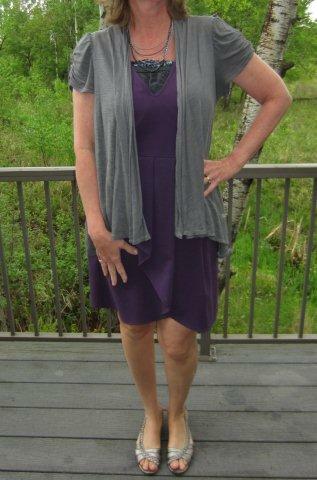 I have to share a photo a reader sent me- this is Susan wearing a great dress! She looks fabulous and is totally ‘owning’ her look! I love this pretty purple color, love the cardigan over it and love her great shoes! Way to go Susan, and thanks so much for sharing! Agreed! A fun little dress is needed in every closet! This one is very cute…love that print! I love the shimmer. Glad you have a go-to that isn’t black. I’m not a big fan of LBD, gulp!